Because if you didn’t have a good grasp on these concepts before moving, you’ll need to get one pretty quick after moving. I very much appreciate Keller’s deeply theological and yet tender writing in this book. Those two things do not often coexist, unfortunately. This one makes the list because the basic story is known but the deeper message is typically missed. This book and the truths in it have the power to reshape our understanding of God’s character and of his view of us. In the world of cross-cultural ministry, God’s character and how he views us are pretty big deals. I recommend this one all.the.time. I had to not-so-subtly sneak this in. Of course, this one is not co-equal to the others, but it’s often overlooked. I’ve written here and here about the importance of the Psalms in the lives of missionaries and cross-cultural workers. There’s nothing wrong with being a pastor at a suburban, wealthy, primarily white church. But this guy isn’t one. So, although he writes from an American context, he also writes from a cross-cultural, multi-ethnic, church-centered context. I also love how he assumes that the majority of people are going to be truly transformed and discipled, not through professional counselling, but through consistent and loving relationships. Life is serious, the world is a mess, and we need the aged brilliance of Chesterton. His humor, his levity in the face of a world that was no-less troubled, his talk of fairies and mysteries and paradox, it’s all for our time. Get to know the author who pretty much gave the world C.S. Lewis. You’re welcome. Welp, that’s it. Have a great day! Oh, and if you have a book that you’d add to this list, link to it in the comments section below. Thanks for dropping by! That’s an intense statement, and I sort of choked when I read it for the first time. But the more I chew on it, and the more I ponder my own life with its episodes of emotional and intellectual crisis, the more I think it’s correct. I spent three years working as an ER/Trauma nurse in an urban hospital in the States, and that bloody, chaotic trauma room forced me to “honestly face the sadness.” Those were dark days indeed; I was ill-prepared, psychologically and theologically, to deal with the darkness and the depth of the pain I witnessed. I was far outside of the Christian bubble, and reality bit hard. Of course, the sadness was present in their affluent passport countries too, but money and familiarity have a way of disguising and hiding pain, like gold lacquer on cardboard. But when the suffering is really seen, honestly, it does what Martin Luther wrote about nearly 500 years ago; it “threatens to undo us.” Of course, it doesn’t have to undo us, but it certainly threatens. Let’s talk about conflict, ‘cause that’s fun. I mean, hypothetically, at some point in the (distant) future, you may or may not experience an uncomfortable disagreement with someone. Maybe. In this imagined scenario, the ensuing “discussion” could arise between you and your spouse or kids or co-workers, or maybe even — like this would ever happen — yourself. So, when conflict comes, what will you do? Will you run away scared? Hunker down? Gear up? Lock and load? 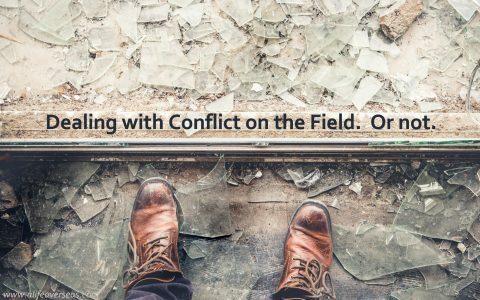 Conflict is not something “out there” that other people deal with. This is us. This is our story.